Shezan is a quaint and cosy restaurant situated on the bustling Cunningham Road and it promises to keep your taste buds wanting more. Their reasonable prices, good portions and their super swift home delivery. Escape the city’s hubbub right in it’s heart by stepping into Shezan — where their glass door locks out all that interrupts relaxing. Simple furniture, comfy sofas and that quintessential red-white chequered table cloth for old world charm, these guys keep it smart and fuss-free. 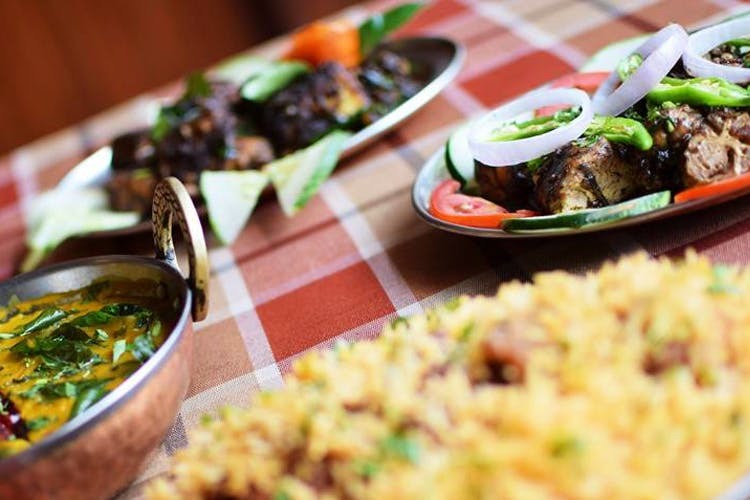 Bring your empty stomachs and take your pick of Mughlai, Continental, Chinese and North Indian food. Don’t miss their Special Tawa Chops and their Egg Chilli. Devour their Biryani Rice if you aren’t one for mainstream biryani. We also love their selection of steaks. It isn’t vast, but offering lamb, chicken and fish in various sauces, it really does feel homely. And at many levels, comforting. Feeling peckish? Munch on tikkas or even hearty soups. Word of advice though: even if you’re stuffed to the gills, try the Custard Apple Kulfi because dessert doesn’t go to the stomach, it goes to the heart. If you’re missing old Bangalore, this is where you should find yourself. Shezan’s warm and friendly owner also has the best stories of Bangalore’s good old days.